West Central Ohio Land Conservancy annual meeting keynote speaker and lawyer Lee Schroeder discussed current legal issues regarding farmland preservation during the West Central Ohio Land Conservancy annual meeting at The Ohio State University at Lima, Wednesday. 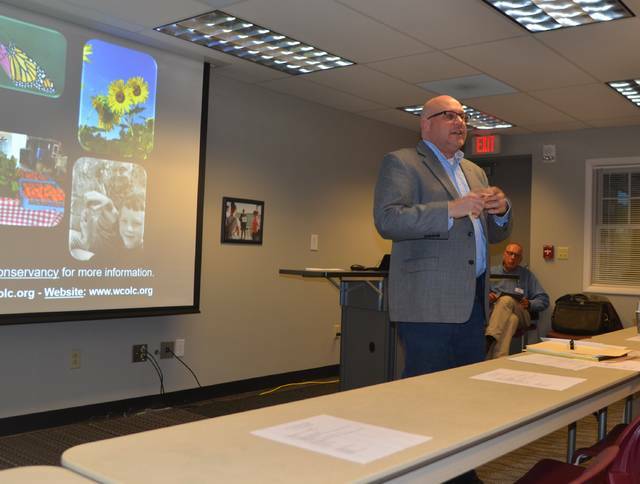 LIMA — Keynote speaker and attorney Lee Schroeder discussed several contemporary and current legal issues regarding farmland preservation during the West Central Ohio Land Conservancy 13th annual meeting Wednesday at the Ohio State University at Lima. The Ohio Conservation and Agriculture Easement Law Process and Protection, the Johnson case, the Ohio CAUV law and federal deductibility of conservation easements were just some of the contemporary and legal issues discussed. Several landowners and West Central Ohio Land Conservancy members across Allen, Auglaize, Hardin, Hancock, Mercer, Putnam and Van Wert counties attended the annual meeting. The West Central Ohio Land Conservancy is a volunteer, non-profit organization that helps assist land owners with preserving and protecting their land through the use laws such as conservation easements. An easement is a law that helps conserve and preserve agricultural land. Right now, the West Central Ohio Land Conservancy have completed 17 easements with more than 1,553 acres of land and are currently working on completing three more with 750 acres of land. The Johnson case was one of the most significant easement cases, according to Schroeder. The case was about an easement signed by a mother and her children, and how her son tried to breach the subdivision restriction once the mother passed. However the Ohio Court of Appeals judged ruled that the subdivision restriction can be enforced through an ag/conservation easement. The Ohio Conservation and Agriculture Easement Law Process and Protection helps protect those with easements preserve and conserve their property. Schroeder also mentioned how the change in the Ohio CAUV law will help lower the tax rate of a landowner’s land that is not actively farmed. That land includes ditch banks, tree lines and fence rows. Another incentive for eligible landowners with easements is that if they decide to donate or sell the easement they can get an income tax reduction through the Federal deductibility of conservation easements. https://www.limaohio.com/wp-content/uploads/sites/54/2018/11/web1_Lee-Schroeder.jpgWest Central Ohio Land Conservancy annual meeting keynote speaker and lawyer Lee Schroeder discussed current legal issues regarding farmland preservation during the West Central Ohio Land Conservancy annual meeting at The Ohio State University at Lima, Wednesday.